CARMEL, Ind. 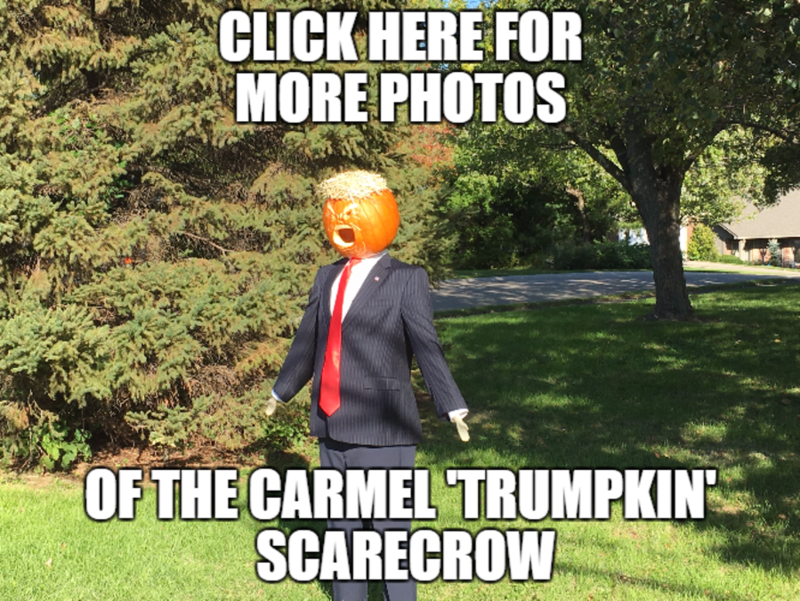 -- The downtown Carmel scarecrow poking fun at President Donald Trump has a running mate. The pumpkin version of Vice President Mike Pence was seen at the house, peeking out from behind a tree. The "Trumpkin" was placed on the property of a home on Main Street near the Arts and Design District. The 'Trumpkin' featured a suit, red tie and very tiny hands. The pumpkin's face was carved to look like it's yelling and features a "toupe" of straw hair. "Trumpkin" was back after going away for a weekend. A sign that read "Went to Mar-a-Lago. BRB" was set up in its place. "Trumpkin had 18 business meetings on the green this weekend. He said he would be back next week," said Ashley Snedeker who lives in the home. "Happy Halloween!" Have you seen any other creative Halloween displays this year? Send them to us at katie.cox@wrtv.com or share them on our Facebook page.